Welcome back! 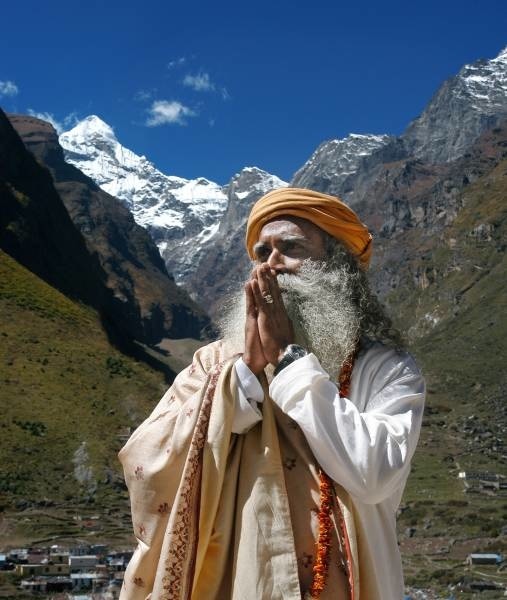 This week's post comes from yogi, mystic, humanitarian and visionary - Sadhguru. His words of wisdom and utmost profundity will once again dig deeper and uncover the power behind yoga and meditation, and how one can benefit from it for a lifetime! "Fundamentally, the word "health" comes from the root word "whole." So what we call "feeling healthy" means that we have a sense of wholeness in us. Medically, a person may be free of diseases, but that is only one part of health. When you feel like a complete human being in your body, mind and spirit, then you can be fully healthy. So there are any number of people who are healthy by medical standards, but unless they experience that sense of wellness from within, they are still lacking something. If human beings have to experience this sense of wholeness, this sense of wellness within themselves, it is important that their body, mind and above all their energies function at a certain level of intensity. Let's say a man is walking down the street. If you look at the way he walks, you clearly know whether his body is well-exercised or not. The very way he strides, you can tell. Similarly, if you look at his face, you can see whether his mind is well-exercised. There are also ways to see whether his energy is well-exercised. So as there are ways to keep the body fit through physical exercise and the mind fit through the process of education, there are also ways to keep the energies fit. So physically, you may be medically healthy but your energies are still lethargic. If you get this checked out, you may find that everything is okay, but still you know you are not rolling the way you should be in your life. Things are not happening for you on the inside or the outside the way they should be simply because you have not taken care of the well-being of your energy. For every physical or psychological situation that a human being goes through, there is some chemical basis to it. Modern medicine has studied this extensively. And today, all medicine has just become chemistry. So for every problem that arises in a person's body, people are just taking one chemical or the other to come to some kind of balance; that is how the whole of modern medicine is being handled right now. But we know very well that if you use one chemical to reduce or enhance something, something else is bound to happen. For one ailment, there is an antidote. And for the antidote, there is another antidote. It's an endless chain because whatever is happening on the chemical level in your body, it is only controlled by the way your energies function. Now somebody says, "No, this man has got acids, so give him alkaline." But why does he have acids? Simply because of the way his body, mind and above all, the way his energies function. In yoga, when we say "health," we don't look at the body or the mind; we only look at the energy. If your energy body is in proper balance and in full flow, your physical body and mental body will be in perfect health. Now when we say keeping the energy body in full flow, this is not about doing a patch up job with some healing; this is about going to the foundation of your energy system and activating it in a proper way. It is about building a foundational practice which establishes your energy in such a way that naturally your body and mind are fine. When it comes to health, no human being gets to live in perfect conditions. The pressures of life, the food we eat, the air we breathe and the water we drink can affect us in many ways. The more activities we have in the world, the more we are exposed to things that can throw our chemistry off balance and create health problems. But if the energy in our system is properly cultivated and kept active, these things will not have an effect. The physical body and the mental body will be in perfect health. There is no question about it. See, life functions in many ways. Let us say you do not know anything about electricity. If the room is dark and I tell you that if you press a button, the whole room will be flooded with light, will you believe me? No. But if I press the button and light appears, you will call it a miracle, isn't it? Simply because you do not understand how electricity works. Similarly, life happens in many different ways. But people have limited themselves to the physical and the logical -- the physical in experience, the logical in thinking. Right now, medical science is limited to just knowing the physical body. If anything happens beyond that, people think it's a miracle. But it is another kind of science. The life energy in you created your whole body -- your bones, flesh, heart, kidneys -- everything. For me, the spiritual aspect came first. As I began meditating, I was able to get myself out of the saddness over the loss of a baby and took on mental yoga. Two months into this, I naturally turned raw vegan. I thus had so much energy and enthusiasm within me that I went back to dancing and doing some yoga. I feel it is very important to balance the mind, body and spirit aspects of ourselves to make the most of what we have.